Delran Township Police Department has partnered with the Drug Enforcement Agency to accept expired prescription medications as well as over-the-counter drugs for proper disposal since 2009. 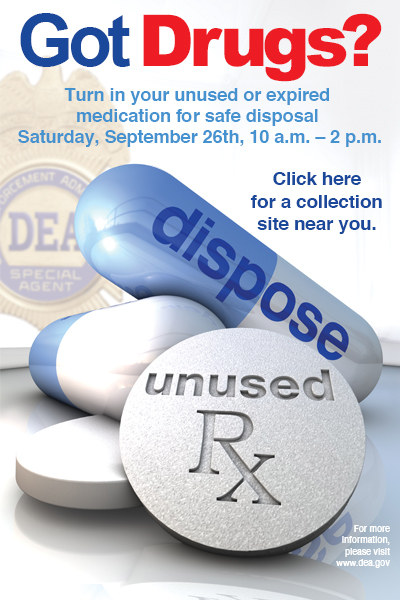 On Saturday from 10am to 2pm, Delran Township Police Department will be accepting unwanted drugs. It’s a free and anonymous process. Delran Township Police deliver the unused/expired/unwanted drugs to the local DEA office for proper disposal. Since the program started in 2009, Delran residents have turned in over 710 pounds of drugs for proper disposal. If you aren’t able to drop off your drugs on Saturday between 10am and 2pm, you can still properly dispose of your unwanted drugs. The Palmyra Police Department has a secure drop off of point for unwanted medications available to the public throughout the year. ← Water or not – Can you tell the difference?